The soup has been simmering since noon. I’ve tasted it at least a dozen times – its hard to judge how much seasoning is needed for this large amount. The night is cold – temps hover around freezing. Jerry drives as I figure out the GPS on my new phone. We arrive at North 6th Street, the address of the Hope Rescue Mission, in an area of our local city I’ve not seen before. I realize I’m nervous as we walk across the parking lot. We join about fifteen friends carrying food into the building. The doors are graciously held open for us by men waiting for dinner. We exchange greetings and I relax. I remind myself about the saying in my earlier post about homelessness. I don’t need to be scared – they are simply people without a home. Carol, a friend with an amazing voice and sweet guitar skills, leads the group (the men and us) as we sing a few carols. The familiar songs bring tears to the eyes of some of the men. I think of the story each of them must have – the story of why they are there waiting for a meal. Suddenly, I wish I had a few hours to hear their stories. But I feel awkward striking up a conversation. I’m not sure how to do that. I’m a task person, so I head to the food counter. A task is something I can handle. 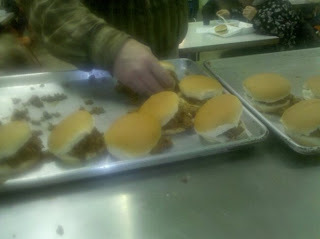 The soup is hot, the sandwiches are tasty and the thank yous are plenty as our group works together to serve dinner. Its busy as we serve, plus I’m cautious about taking pictures, so I only have these two photos – but I have memories of smiles and compliments. The men are kind, thankful and gracious. We greet and acknowledge each one. I see some hope (one man is excited about a new job he started that day) but I realize I see more sadness, stress, disappointment and confusion. While serving, my friend Greta says something to a few of us about what we will serve the “next time.” A few raise eyebrows, “Next time?” Greta says, “Yes, we are doing this at least once a quarter.” Everyone promptly agrees. On the ride home, Jerry tells me about Sam, a gentleman from Georgia he ate dinner with. Jerry is quiet and reserved – and he’d been cautious about going, so I hadn’t expected him to connect with anyone. But he did, he enjoyed it and he’s thinking of ways he can help Sam after hearing some of his story. I begin to beat myself up. Why didn’t I try to connect more? Why did I focus on the task of serving more than on connecting? And I realize that it is. Yes it is! Love in the form of food. I tend to want to save the world and if I can’t do it all at once, why bother trying? The words of Jesus come to mind, “I was hungry, and you gave Me something to eat.” So I stop beating myself up. Instead I use my energy to pray for the men and for John, the director of the mission and for our next time there. I’m grateful we went and that we added one drop to the ocean of love on a cold December night. I’m really thankful that we plan to go again. We’ll serve more food and more love. There’s a love blog carnival happening today. To read more posts about love – go to One Word at A Time by Bridget Chumbley. God used you there, Janet, as much as he used Jerry and Greta and all the others. He defines "results' differently that we do. Thanks for sharing this story — it's one we all need to hear and to be. The love that is returned to us when we serve is hard to explain – you did that very well. Thanks, Janet, for being such a faithful servant. I would certainly agree that your love spoke through your actions. Maybe next time you'll feel comfortable talking more, but I'm proud you for serving like you did. Enjoyed the post! Oh, food is DEFINITELY a love language! Just ask my grandmother-in-law from Mobile, AL! Seriously, service is one of the sincerest expressions of love. God blessed your faithfulness in the hearts and stomachs of those men. Janet, I am like this myself… I sometimes don't see what I have to offer as being as important as some of the other 'gifts' people use to reach out. This post is a great reminder that ALL of us and our gifts are important! 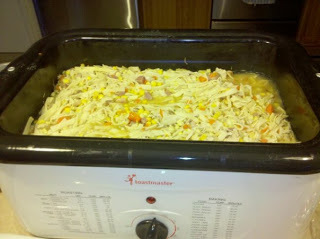 That soup looked delicious and it filled people up in more ways than one! it was a lot of love. Thinking back on some of my special childhood experiences, I remember more about how yummy mom's homemade chocolate chip cookies tasted right out of the oven than what anybody was saying to me at the time :). I think the homeless people would see you as an angel coming to their rescue with the hot soup to keep them from starving. Anyway you look at it, you are still a blessing in their lives! Love is always growing. It is less important that we feel we've loved perfectly than it is to know we have loved genuinely.